JioPhone seems to be the next big revolution for people looking for a second handset. Not just you are getting the unlimited internet and calling facility, the phone is one smart way of connecting your smartphone to the internet via Wi-Fi hotspot. Here, you can enjoy an exclusive Jio experience by mirroring your content on a TV through JioMediaCable. The phone comes with 2.4 inch QVGA display, single nano SIM slot, removable 2000 mAh battery, 4GB internal memory and 1.2 GHz dual core processor with 512MB of RAM. Jio offers 2 MP primary and 0.3 MP front camera with this device. It support 4G VoLTE and 22 Indian languages for best ever usage. If this still felt less, JioPhone comes with torch, voice enabled search, Jio application bundle, Bluetooth, NFC, GPS and USB connectivity. The phone is practically free while one time security of INR 1,500 is required at the time of purchase. One can return the phone after 3 years and take the whole amount back. 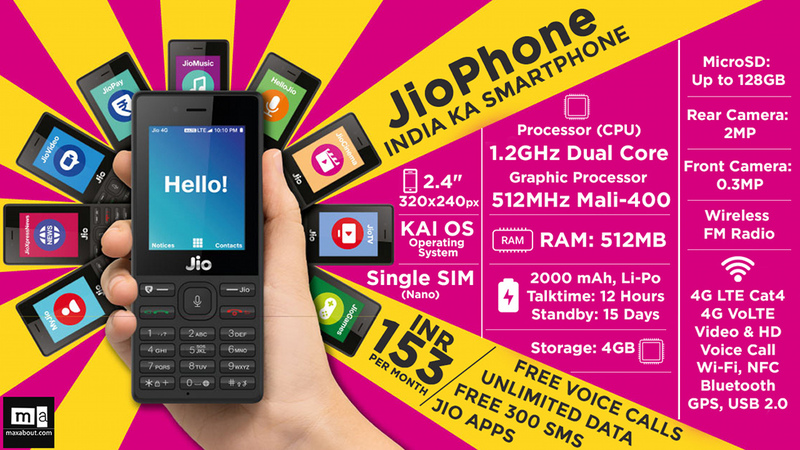 Buyers will need to recharge their JioPhone with an INR 153 plan every month to continue with all these services, cutting the cost by half from existing Jio SIM users. The phone will come preloaded with apps such as JioCinema, JioMusic, JioTV, and JioXpressNews, along with popular instant messaging and social networking apps.